​How many licks does it take to get to the center of a Scorpion Sucker? There’s only one way to find out! Prove your bravery and enjoy a sweet treat when you pop a Scorpion Sucker in your mouth and consume a real scorpion, stinger and all. The non-venomous arachnid is perfectly safe to eat…if you’ve got the stomach for it! And if you’ve got what it takes to chomp down on a scorpion, why not savor the flavor and pair it with fruit-flavored hard candy like blueberry, strawberry, apple, or banana? 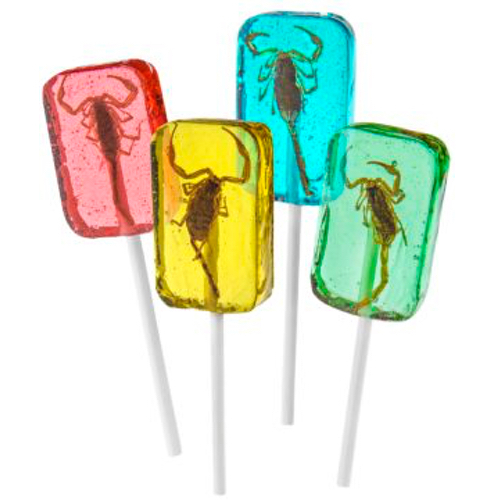 Sold in a 4-pack featuring one lollipop of each flavor (plus those scorpions! ).